Ten-year old Courtney Brower was diagnosed with juvenile arthritis at age 5 after jumping off of a swing. She faces a number of conditions, including polyarticular arthritis, meaning more than five of her joints are affected; enthesitis-related arthritis, which means her tendons and ligaments are affected; ankylosing spondylitis, which is arthritis of her spine, and TMJ arthritis, which is arthritis in her jaw. She also battles Ehlers Danlos Syndrome, which makes her joint loose. Shortly after her diagnosis, Courtney began to take control of her disease, injecting herself with three shots per week to control her arthritis. Six months after beginning treatment, her medicine began attacking nerves in her body, and she had to switch medications. She began infusions and continued those for three years. Courtney has struggled to find a medication to control her arthritis, and she began a trial drug that has not yet been approved for children with arthritis. 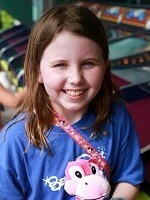 Despite her daily pain, it does not stop Courtney from being an active, vivacious 10-year old. Instead, she is more determined to accomplish things. Courtney plays volleyball, basketball, and tennis. She swims and runs track. She also loves to play the viola and was a member of the Student Council at school this year. She misses a lot of school to travel to Cincinnati Children’s Hospital for treatment, but it does not stop her from making straight A’s in school! Along with being involved in numerous school activities and sports, Courtney loves to advocate for those with arthritis. At age 7, she testified at a Senate hearing for the step therapy bill for Indiana. The past two years, the Browers have traveled to Washington D.C. to meet with elected officials to talk to them about important medical bills. “If we don’t go, who else will go and fight for our state?” said Courtney. Courtney was instrumental in bringing the Jingle Bell Run back to Warsaw. She wants to raise awareness to others that kids get arthritis, too, and that it is not the same type as adult arthritis. She wants the community to know that kids with arthritis are not faking their pain. Courtney wants everyone to know that kids with arthritis are not contagious, that they are stronger than anyone will ever know, and they just want to be normal kids. We are excited to honor Courtney Brower as the 2018 Jingle Bell Run Warsaw honoree! Join Courtney in the fight against arthritis, donate today!